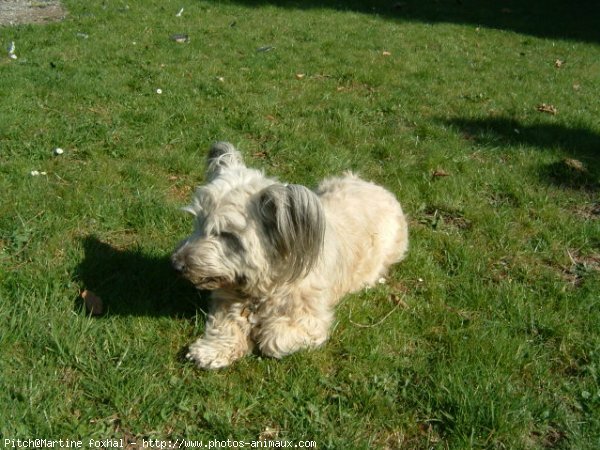 A rather elegant dog, the Skye Terrier has a long, low set body, approximately twice as long as it is tall. The dog has a long, thick, double-layer coat, composed of a short, soft undercoat and a long, harder topcoat. The hair is usually black, blue, gray, silver, fawn, or cream, with black ears, muzzle, and tail tip and occasionally a white spot on the chest. The hair is parted down the middle of the back. 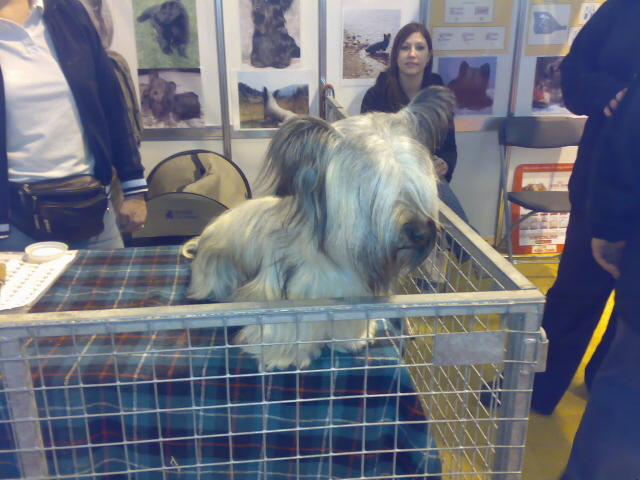 The Skye Terrier has a fairly large, powerful muzzle, a black nose, and round brown eyes. The eyes are usually protected by a fringe of hair. The ears may be either prick or drop. Prick ears are medium-sized and placed high on the head, with an erect outside edge. Drop ears hang down against the side of the head. The teeth form a scissors bite. Skye Terriers have long, large, hare-like feet. Their bodies are strong and solid, and the tail is long and covered in hair. It is known for being good-natured and polite. Although standoffish and wary of strangers, Skye Terriers are affectionate and playful with their friends. These tend to be rather serious dogs which do best in one on one relationships. Skye Terriers thrive in a quiet home atmosphere, one without children or other pets, and are very loyal and devoted to their owner. The dog tends to be possessive and will bark or become aggressive if it feels threatened. 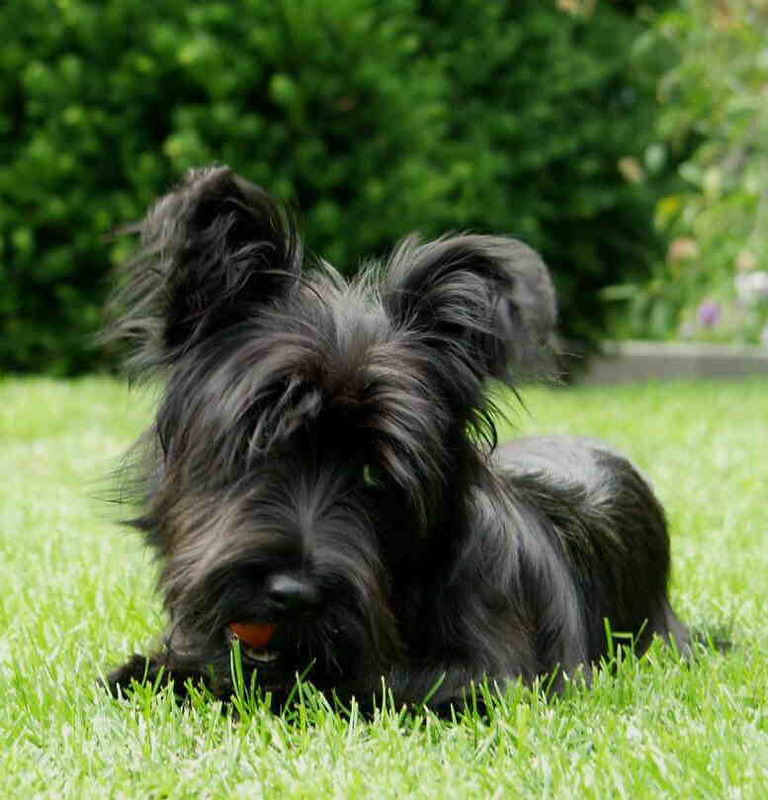 Skye Terriers require careful training and extensive socialization to avoid aggression towards strangers. The coat is prone to tangles or mats, and needs frequent brushing with a sturdy brush, such as a metal comb or pin brush. The dog should be bathed no more than once a week. It is also important to clean the ears and the hair around the mouth and eyes. 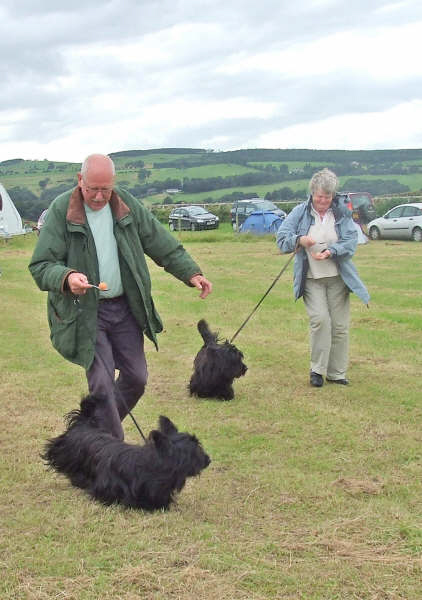 Skye Terriers do not require a lot of exercise; they are capable of keeping themselves busy and active inside. The Skye therefore does not need a house with a yard, although the dog does, of course, enjoy walks outside. Training is most effective in short sessions, to prevent boredom. 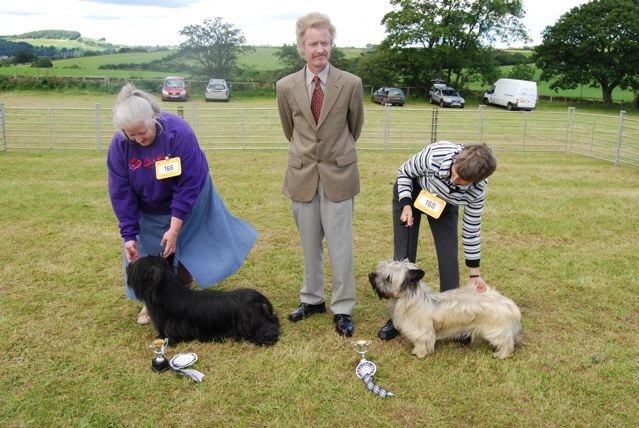 Skye Terriers respond well to trainers who set firm boundaries and use positive reinforcement. The dog tends to perform well in track and agility events. They were first bred in Scotland over 400 years ago, although there is some mystery as to their exact origins. 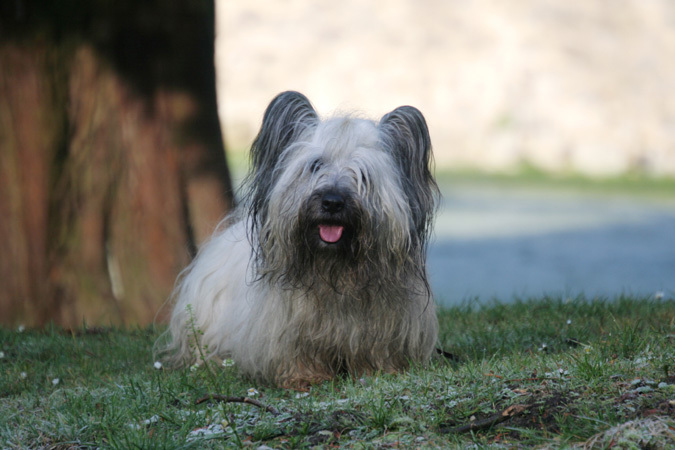 Some say that the Skye Terrier first came into existence after a Spanish ship crashed into the rocks of the island of Skye in the Scottish Hebrides. Native Scotsmen found, among the survivors, several Maltese dogs. 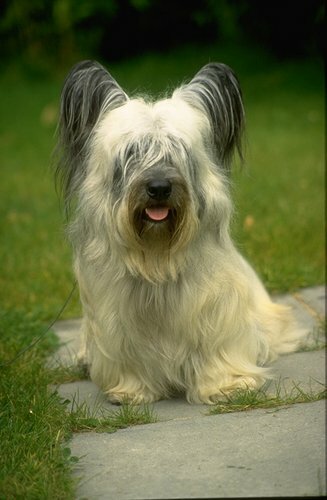 It is claimed that they bred these Maltese with their own native terrier to create a new breed, the Skye Terrier. 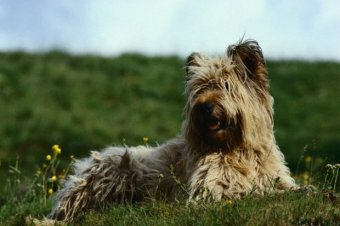 Whether or not this is true, the fact remains that for many years the Skye Terrier was only to be found in the northwestern part of Scotland. The Skye Terrier came into fashion, so to speak, after Queen Victoria discovered and took a liking to the breed in the 1800s. The breed then became very popular, especially among the nobility. The dogs were even featured in paintings by Sir Edwin Landseer. 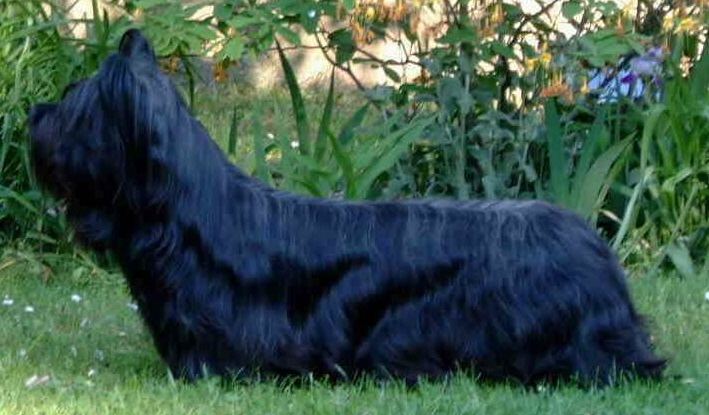 Since then the breeds popularity has declined, although many still remain faithful to this unique dog.The Skye Terrier is renowned for its loyalty and dedication to its master. 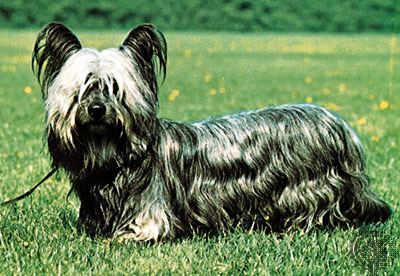 Legend tells of a Skye Terrier named Bobby who waited faithfully by the grave of his deceased owner for ten years. According to this story, he was fed and cared for by local townsfolk until he too died.The dog made its debut at an English dog show in 1864, and was first registered with the American Kennel Club in 1887. Before the turn of the century, this breed was very popular at dog shows in the US, though its popularity waned somewhat during the 20th century. Nevertheless, the Skye Terrier can still be found in the homes of owners who treasure the dogs endless loyalty and plucky spirit.